What Will Be "In" And "Out" In New D.C.? No matter how you feel about the change Barack Obama champions, there's no disputing that things will be different in the nation's capital starting Tuesday. So, what will be "in" and what will be "out" when the new president comes to town? Washington Post columnist Amy Argetsinger gave her take on The Early Show Saturday Edition. She admitted, "It's all speculative," but said, "There's excitement in the air. It's that same feeling you have when you're about to enter a new decade, or like back in 1999, when we were on the verge of the new millennium. "The funny thing, though, is that nothing really ever changes in this town. Republicans working in the public sector will now go back to private sector and vice versa for Democrats." What about the city of Washington itself? I would say that being intellectual and wonky is going to be cool again. Being able to name-drop philosophers will become a necessity. Mr. Obama loves philosophy. If you want to appear cool, you'd better be ready to quote well-known philosophers. How about life at the White House? The arrival of the Obama family in the White House means having little kids will be cool again. Many Washingtonians will want their daughters to have play-dates with the Obama girls. Having your mother-in-law live with you will also be making a comeback! And what about presidential lifestyle differences? Both Mr. Bush and Mr. Obama are big on fitness. Mr. Bush is well-known as a mountain biker and, with Mr. Obama, it's all about playing basketball. There was even talk that he was going to transform the White House bowling ally into an indoor basketball court. How will fashion evolve with the new administration? With Michelle Obama, sheath dresses will be back in style. 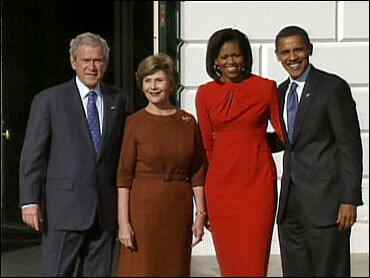 Laura Bush stuck mostly with pantsuits. Michelle has almost taken on the style of Jackie O. Michelle has great arms, so she wears lots of sleeveless dresses. The 1960s style is back. Who will be performing at White House dinners? Mr. Bush loves country music and Mr. Obama is more about mainstream rock and hip-hop. We're about to have a president who's making it cool to know about young people's music. It's a youth thing more then a race thing. Out: Kenny Chesney and George Strait. In: Bruce Springsteen and John Legend. And how about food? What are Obamas' culinary tastes? Out is Mr. Bush's favorite type of food, Tex/Mex. In will be going out to restaurants. Mr. Bush rarely ventured out of the White House to eat. And just in the last few weeks, the Obamas have been seen dining out at numerous D.C. eateries. Mr. Obama recently told a Washington Post reporter that he and Michelle hope to go out in D.C. every couple weeks or so on a "date night." They're also big on pizza delivery orders!